Emanuele Torquati has been invited to take part in NEW DIRECTIONS FESTIVAL 2014, that will take place in Lulea (Sweden) from 22nd till 24th May. 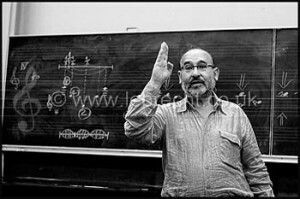 The Festival is focused on Salvatore Sciarrino’s music, and the composer himself will be present and will teach during a workshop for young composers. Emanuele will perform on 23rd May with cellist Francesco Dillon, DISTANT VOICES, STILL LIVES project, featuring a.o. Sciarrino’s Melencolia 1, and on 24th May two Sciarrino’s seminal works, Perduto in una città d’acque (1990-91) and Due Notturni crudeli (2001). “Perduto” was written straight after Luigi Nono’s death and the “città d’acque” of the title is Venice, where Nono lived his life. The first of 2 Notturni crudeli is based on an ecstatic repetition of very high chords interspersed with extremely fast notes in other registers, and brings the listener to a timeless dimension; the second, “Furia, metallo” is a relentless alternance between loud chords and fast figurations.